In the quest to counter the rise of the rampant bacterial infection Leprosy, the Ministry of Health and Family Welfare has conducted an intensified leprosy case detection program to bring into light hidden cases. Thousands of such cases were found in the drive, where several volunteers supported it including accredited social health activists who went door to door to check for such patients and help them start formal medication. “At least 20,000 hidden cases were detected” during a massive door-to-door campaign from September 14-October 4.” States Dr Anil Kumar, deputy director-general, National Leprosy Elimination Programme (NLEP) in an Indian Express report. Leprosy which was declared departed from India, as public health problem in 2000, where less than one case per 10,000 persons was seen as per WHO fact sheet is now back in numbers. It is estimated around 60 % of leprosy patients in the country calculated across the world, as stated in an Indian Express report. An official of the Ministry of Health and Family welfare said that the need for a leprosy case detection programme was undertaken on a war-footing to identify hidden cases and start immediate treatment. Talking of the statistics: 163 districts across 20 states over 20 days, is the stats that helped the government detect several patients suffering from the fear of stigma, laid back into their apartments, refraining to meet people in the fear of being caught into disgrace named “Leprosy”. When asked about the further steps after detection, Dr. Kumar told IE “Those identified with the symptoms will be referred to medical treatment,” said Kumar. Dr Sanjeev Kamble, joint director of health (leprosy) in Maharashtra, said that tests are underway to confirm the early diagnosis in “hidden cases”. A majority of cases in the state were found at Palghar, Gadchiroli and Chandrapur. According to the Ministry data, cases of Grade II or permanent disabilities due to leprosy have been on the rise over the past decade. In 2007 – 08, 3,477 casesof disability were recorded, rising 68% to 5,857 cases in 2015-16. 4,400 hidden cases have been confirmed in Bihar. 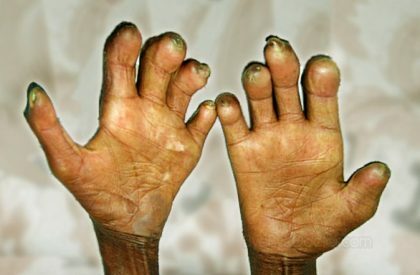 According to a world health organization factsheet leprosy is a chronic infectious disease caused by Mycobacterium leprae, an acid-fast, rod-shaped bacillus. India reports the highest number of new leprosy cases in the world. The Indian Council of Medical Research (ICMR) estimates that actual cases could be as many as 2.5 -4 times higher than the current reported figure, according to DNA. NLEP report points out to at least 1.25 lakh new cases detected in 2014-15 in the country. “A decade later, in 2015-16, India has 1,27,326 cases, an increase of1.22% from 2014 – 15” states DNA report. Symptoms include affects on skin, the peripheral nerves, mucosa of the upper respiratory tract, and the eyes, deformation, breaking of skin nodules and lump formation, leading to disability. Multidrug therapy (MDT) treatment has been made available by WHO free of charge to all patients worldwide since 1995. It provides a simple yet highly effective cure for all types of leprosy. More than 16 million leprosy patients have been treated with MDT over the past 20 years. A similar drive was also conducted in the months of March to April to stop the rising rate of leprosy cases, in these 50 districts from seven states were targeted, where around 65,427 suspected cases were identified out of which 4,120 turned out to be confirmed later.